Illegal act of insider trading, commentary on the public sphere (by means of private advertising in public space) within the city of Vancouver, urbanization, deconstruction of opposing ideologies in the public realm, multiplicity of public discourse, street audience issues. 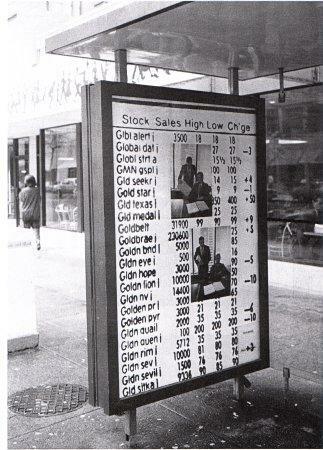 Negotiating with the City of Vancouver, a double-sided bus shelter advertising display case was secured at the Southwest corner of Burrard and Robson Streets, between February 29 and June 13, 1988. Participating artists produced new work specific to the conditions of the project and exhibited for five consecutive three-week periods. Trading by Ross Muirhead and Squid the most intelligent of the invertebrates by Don Gill are set simultaneously on the front and back of the bus shelter's advertising case.